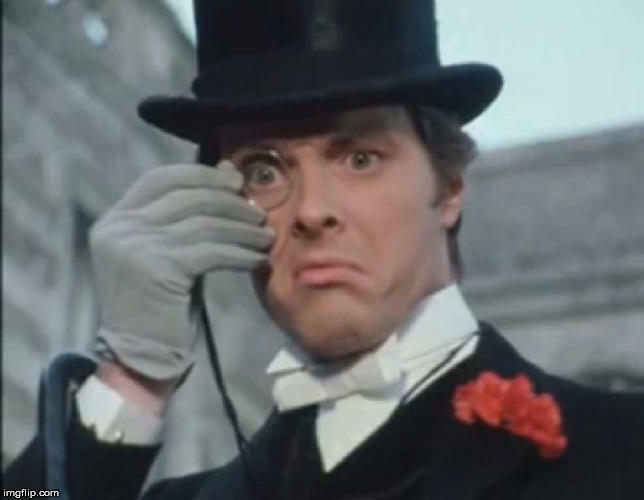 Girls, would you date a guy who regularly wore a suit, gloves, top hat, bow tie and a monocle? Haha! Actually, I bet some sort of geek fandom girl would. You see those couples sometimes. It's cute. The top hat reaaallly takes it over the edge for me. If he was hella cute, I'd deal with it. But that's just so eccentric, I would wonder if something was off with him. Does it matter whether your potential SO is more or less attractive than you? Does music taste factor in when dating someone? Will you date someone who has no manners/impolite/no class? Why/why not? Did it happen too fast? Singles, do you all feel confident you’ll find the right person? No lol 😂 just not my thing. Haha why not but depends on his personality. Personally I love retro style and I like to wear elegant retro outfits. Did you do it in the library with the candlestick? Lol he would probably be certifiable, but sure. I'm crazy too. Let the crazy out! Hell no. We'd clash with our attire. I don't dress up and wear jeans mostly. I don't see why not. I love it when guys can make me laugh. a suit is fine but the gloves, top hat, bow tie and the monocle is a bit too much dont ya think? Not my style at all, I'm more into guys who dress in comfy / sporty clothes. This is not he 1800s. Trust me, there's a small subculture of people that dress like that daily. I wear 1800 style clothes sometime because I don't need to follow modern trends just to "fit in". @InTimoreDei hell you went all the way back to the slave master days. At least do something from the last century. I do. Most of my clothes are 1920's to 1960's. @InTimoreDei do you get them from vintage stores. How do you know that’s what they wanna ore back then? Like is it the same brand? People like us are usually historians as well so we know the history behind the fabrics. I get them from vintage fairs, vintage stores, and handmade by historians that make authentic stuff. I even have authentic Celtic and Norse shirts that were made in accordance to books found from that era. If it suits him then why not? Manacles and top hats aren't my thing. Does he do silly walks too? Does he take off the gloves before he wipes? Home > Dating > Girls, would you date a guy who regularly wore a suit, gloves, top hat, bow tie and a monocle?